Owing to some horrendously long flight times, scientists have speculated that certain birds are capable of sleep during flight. A remarkable new experiment by an international team of researchers has now proven this to be true, showing that birds can catch a snooze while hitching a ride on rising air currents. In a new paper published in Nature Communications, Niels Rattenborg from the Max Planck Institute and colleagues from several other institutions have offered the first proof showing that flying birds can sleep with either one half of their brains active, or with both hemispheres shut down at the same time. Remarkably, these birds can retain their navigational ability while in REM sleep, which involves temporary loss of muscle tone. Scientists are well aware that certain birds, such as swifts, songbirds, sandpipers, and seabirds, don’t get nearly enough sleep. To help them stay aloft for days, weeks, or even months at a time, scientists have assumed that these long distance fliers have evolved the ability to sleep during flight by engaging in unihemispheric sleep, that is, leaving one brain hemisphere active while the other gets some rest. And in fact, this is exactly what dolphins do to prevent drowning. Unihemispheric sleep allows an animal to get some rest, while also allowing it to maintain awareness of its surroundings. Trouble is, unihemispheric sleep in flying birds has only been assumed, though it has been observed in ducks while they perch on land. Prior to the new study, no scientific evidence existed to support such a claim. 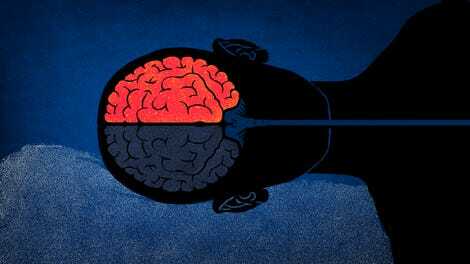 To solve this mystery, Rattenborg and his colleagues recorded the brain activity of flying birds to see if they enter into one of two different types of sleep: slow wave sleep (SWS) and rapid eye movement (REM). Working with researchers from the University of Zurich and the Swiss Federal Institute of Technology, Rattenborg’s team developed a small device that, when strapped to a bird’s head, is capable of recording electroencephalographic (EEG) brain activity, while also checking for head movements. 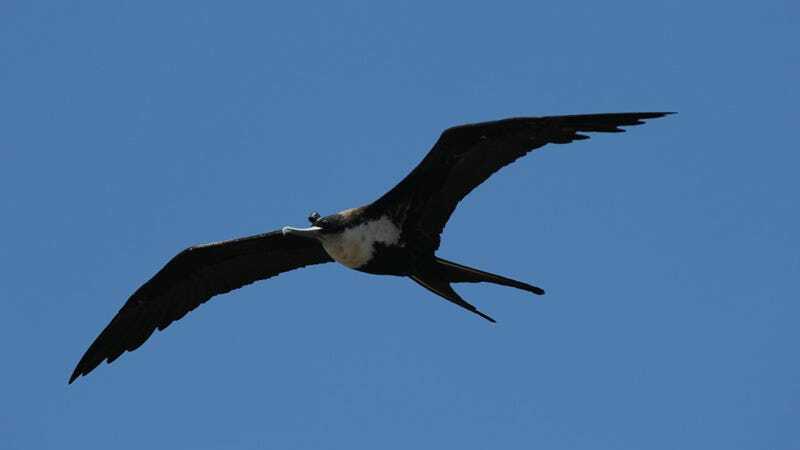 For the experiment, the researchers chose to study frigatebirds, who nest on the Galapagos Islands. These birds often spend weeks flying nonstop over the ocean in search of prey. With this nifty little device strapped to their heads, the frigatebirds flew upwards of 1,850 miles (3,000 kilometers) without stopping for a break. Once the flight data recorders were recovered and analyzed, the researchers discovered some surprising things. The birds remained awake during the day, but as the sun set, and as they went into soaring mode (as opposed to active foraging mode), they went into SWS for durations lasting up to several minutes. Interestingly, and quite unexpectedly, the SWS sometimes occurred in one hemisphere at a time, or in both hemispheres simultaneously. The researchers concluded that birds don’t need unihemispheric sleep for aerodynamic control. That said, unihemispheric sleep occurred quite often, and it happened while the birds were circling, rising up on air currents. This suggests that the birds were literally keeping one eye open, watching where they were going, likely hoping to avoid a collision with other birds. Occasionally, the birds also entered into REM sleep. That might seem like an extremely risky thing to do while flying, but it’s important to realize that REM sleep in birds isn’t like it is in mammals. Unlike us, where bursts of REM sleep are lengthy and involve complete loss of muscle tone, REM sleep in birds lasts for only a few seconds. That said, the resulting loss of muscle tone caused the heads of the birds to dip during flight, but their flight patterns weren’t affected. Despite their remarkable ability to sleep while flying, frigatebirds still get excruciatingly little sleep. On average, these birds slept for only 42 minutes per day. By contrast, these same birds will sleep for about 12 hours a day when on land. This suggests that frigatebirds are seriously sleep deprived during their foraging flights. But how they’re able to function with such little sleep remains a mystery.